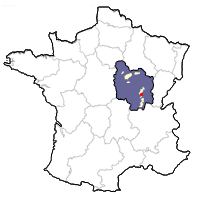 The appellation Bourgogne Côte Chalonnaise was created in 1990 for the wines from 44 communes in the northern part of the Saône-et-Loire department, to the west of Chalon-sur-Saone. The soils vary over this 40-kilometer expanse, ranging from limestone in the north to granite in the south. Altitudes vary from 250 to 350 meters. The Côte Chalonnaise distinction on the label differentiates it from Bourgogne Rouge from the Côte d'Or or the Cote de Nuits. This allows producers in places like Montagny to release red wine with slightly higher clout.